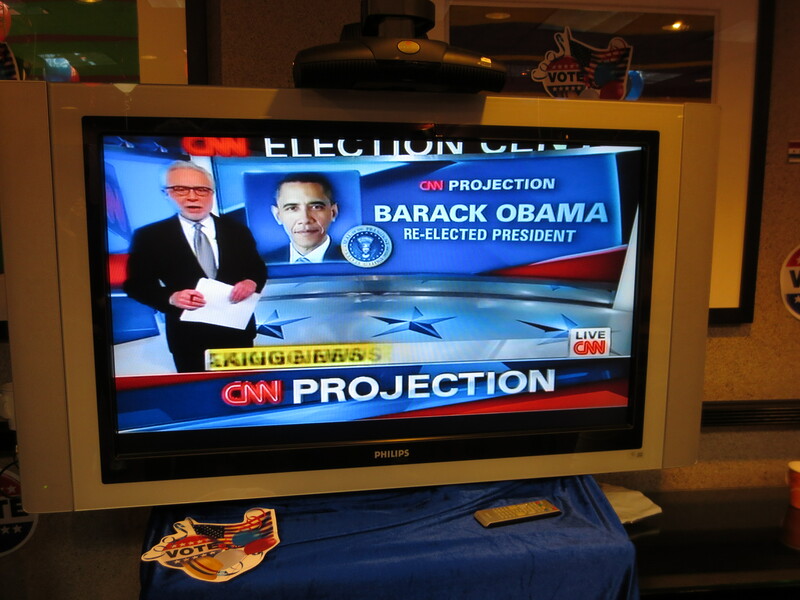 The US Consulate had a very nice Election Day event on Wednesday. Yup, on Wednesday—because of the time difference (during standard time we’re 13 hours ahead of the East Coast), we had the rather pleasant experience of being able to “stay up” to watch the returns come in, and all the speeches get made, and then enjoy a mid-afternoon glass of champagne before heading off to dinner. It felt very civilized. The event was intended principally for local college faculty to bring 10-12 of their students to witness Democracy In Action. So there was a mock voting booth, some speeches from the consul general, a pitch for students to consider studying in the US, and so on. The student-to-balloon ratio was roughly 2:1. The invitation had promised food that was “American fare,” so we were pretty excited about that. When we got to the consulate, we saw a Pizza Hut delivery moped outside and thought “It can’t be….” But it was! Pizza Hut pizza for all to enjoy. Cate got a slice, leaned down to take a bite, and recoiled. Imagine our dismay when we learned that, in Hong Kong style, the pizza had seafood on it. Sure, you can get clams casino pizza in New Haven, but come on. The big event was the mock voting. This was a big enough event that the media that was there—and there were a lot of cameras—basically formed an arc around the voting booth and took a dozen photos of each of the 100+ students as they emerged. Cameramen kept bumping into us in their quest for the Perfect Shot. And the Perfect Shot was always a student emerging from the mock voting booth. The consulate also provided some helpful informational packets for those unfamiliar with the candidates. 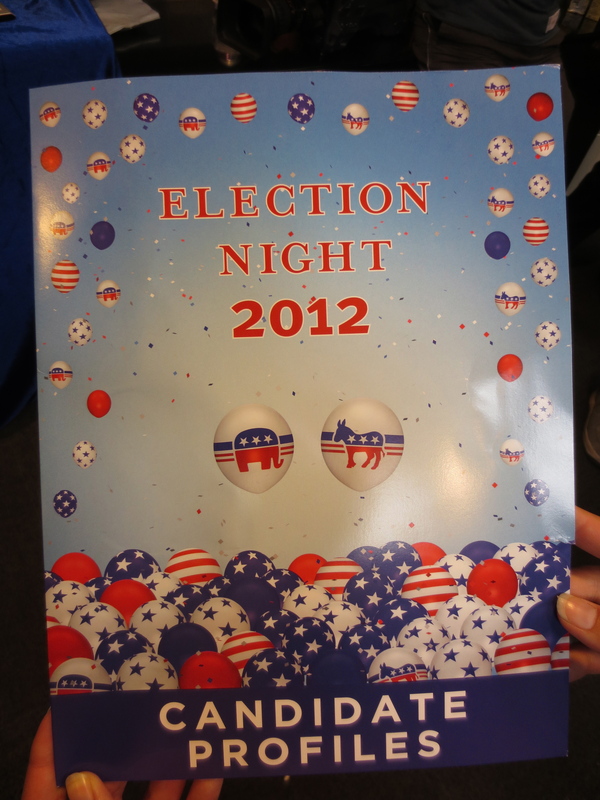 Interestingly, the typeface used on these materials was Gotham, part of the Obama campaign’s 2008 official look. This was (allegedly) a non-partisan event, but this helpful flyer that the consulate put together featured a lot of type set in the Obama campaign’s favored typeface, Gotham. (As in “Candidate Profiles” at the bottom.) Coincidence? So it was kind of funny when the consulate folks kept saying that this mock vote was “unofficial” and “just for fun” and “does not reflect the views of the US Consulate of Hong Kong and Macau.” You know, just in case some student from Nanjing thought he was electing the next president of the United States. There were several fascinating conversations that we had (or overheard) with the students. A student from Australia and another from Finland were pumping us for information about how the US election system worked. 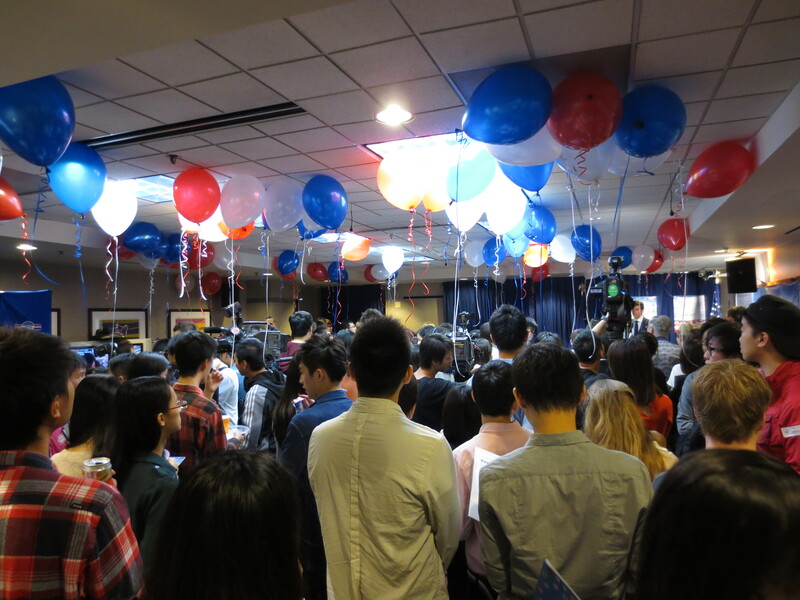 (Oddly, Cate and I were among the very few Americans in the room, as it was largely foreign students.) The Electoral College system was a source of considerable “Huh?” and for good reason. 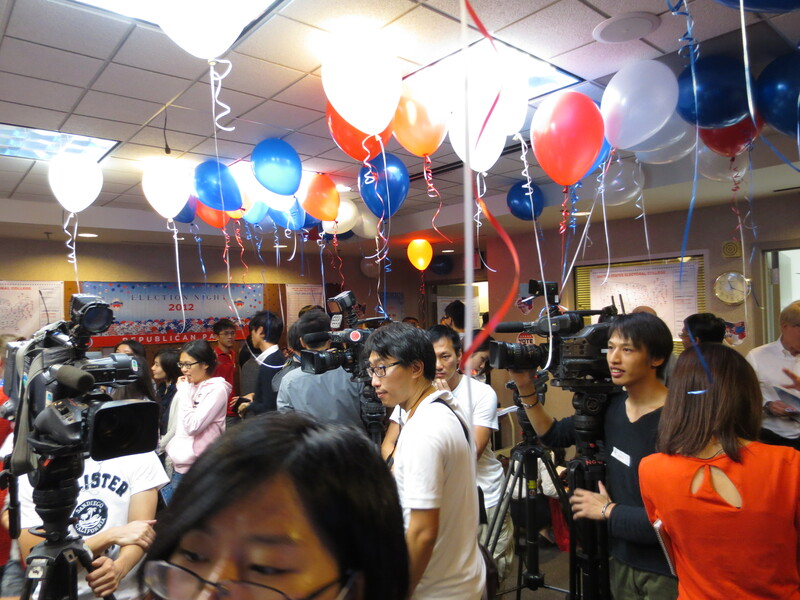 But one student from mainland China was really awed by the spectacle of the election and by how seriously people seemed to take it. This was particularly poignant given that the 18th National Congress of the Communist Party of China is going on this week too. The “elections” and “voting” that take place there are not exactly nail-biters. Or, you know, broadly participatory. Here’s a student being interviewed by one of the Hong Kong television stations. I would tell you what they were talking about, but it was pretty loud in there and I couldn’t hear. Also, I don’t speak Cantonese. TVB Pearl gets the inside scoop. Then we all stood around and waited for the real results to come in, which of course occurred far earlier than anyone had expected. The results are in, and it’s not even lunchtime yet. A few speeches, a little mingling, and that was it. Out into the mid-afternoon sun we went, toasting victory with a glass of prosecco at Domani. Totally enjoying your dispatches Rob! Keep up the good work.